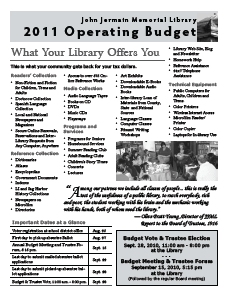 On September 28, 2010, from 11:00 a.m. to 8:00 p.m., the John Jermain Memorial Library will hold a vote on our 2011 Operating Budget. Four Library Trustees will also be elected. The vote will take place on the library’s lower level. There are four trustee positions open in this election. (The starting dates and lengths of the various terms are included in the budget newsletter.) Two incumbent trustees, Carl Peterson and Carol Williams are running for reelection. Current Trustee Nancy Hallock will step down at the end of her term in December, leaving her seat open in the election. In addition, Trustee Tippy Ameres resigned from the Board last year and her seat remains open. In addition to Mr. Peterson and Ms. Williams, former President of the Friends of the John Jermain Library, Lynley Whelan has filed a petition to run for one of the vacant seats. On Wednesday, September 15th at 5:15 p.m., there will be a Candidate Forum at the Library in order to give the community a chance to meet and ask questions of the Trustee candidates. The regular monthly meeting of the Board of Trustees will follow the Candidate Forum. The Trustees and Staff of the Library encourage everyone to vote in this important election. What's Happening Outside the Library?